This page provides some details of my efforts at automating my Exploradome. 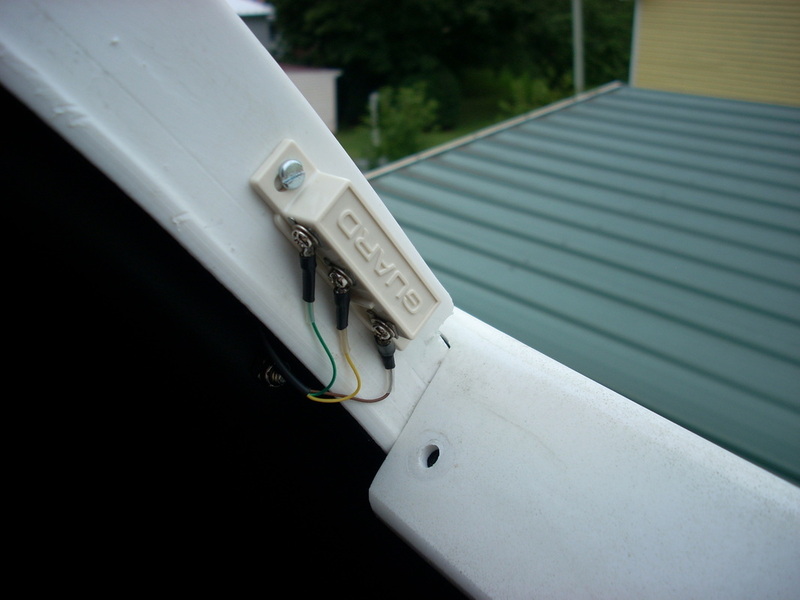 The automation software I'm using is Lesvedome, an affordable do it yourself dome automation package from http://www.dppobservatory.net/DomeAutomation/DomeDriver.php. The Velleman K8055 USB I/O controller is the interface between the PC and the motors, encoder and switches. 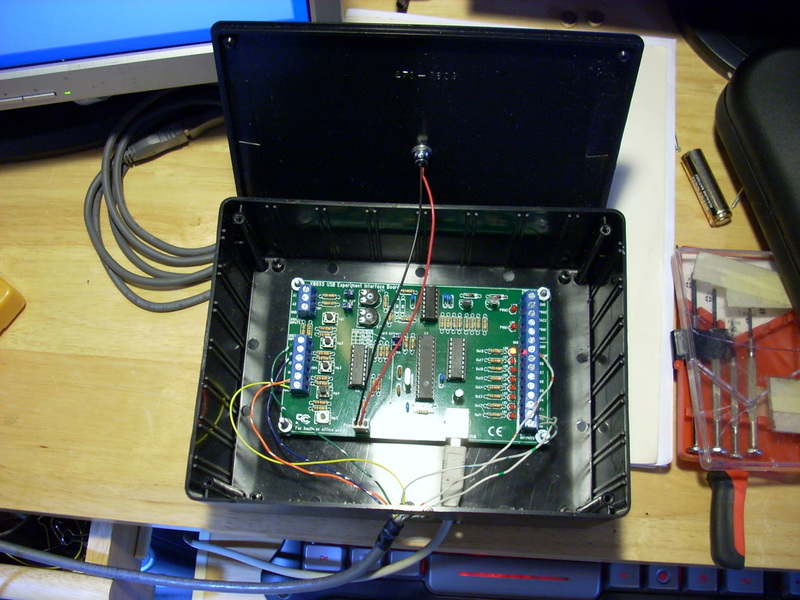 The K8055 sold by Radio Shack is a kit and requires some soldering skills to assemble. The controller is also available already assembled from Ramsey Electronics (http://www.ramseyelectronics.com/) if you're not into soldering. 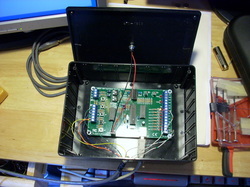 I mounted the K8055 for the E-dome in a Radio Shack project box that is wall mounted in the control room. I installed a panel mount power LED on the case cover which plugs onto a two-pin header I soldered in the LED holes on the controller board. 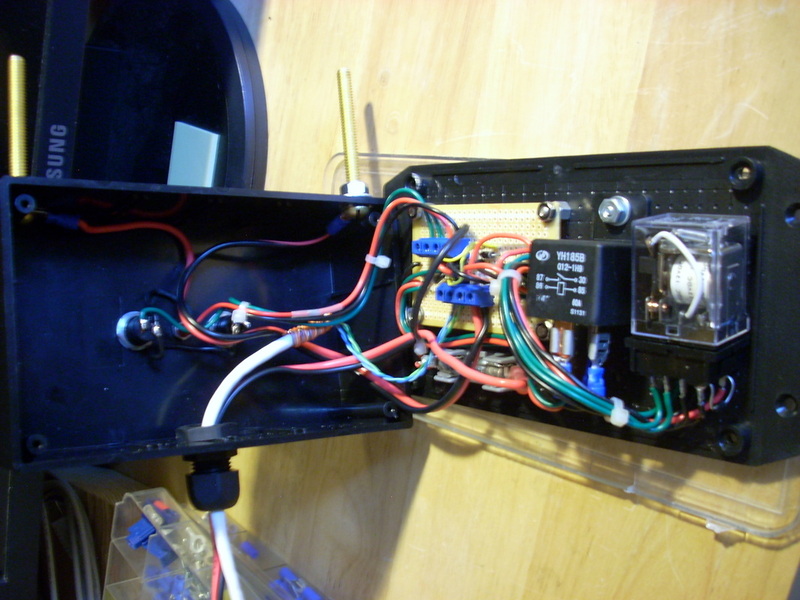 The E-dome relay control box and wiring for the azimuth motor and switches. The aluminum chassis was a surplus item. The terminal strips and switches are Radio Shack parts. Relays are listed above. 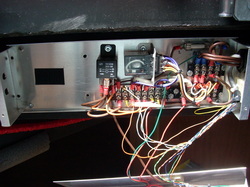 The top section of the relay control box. 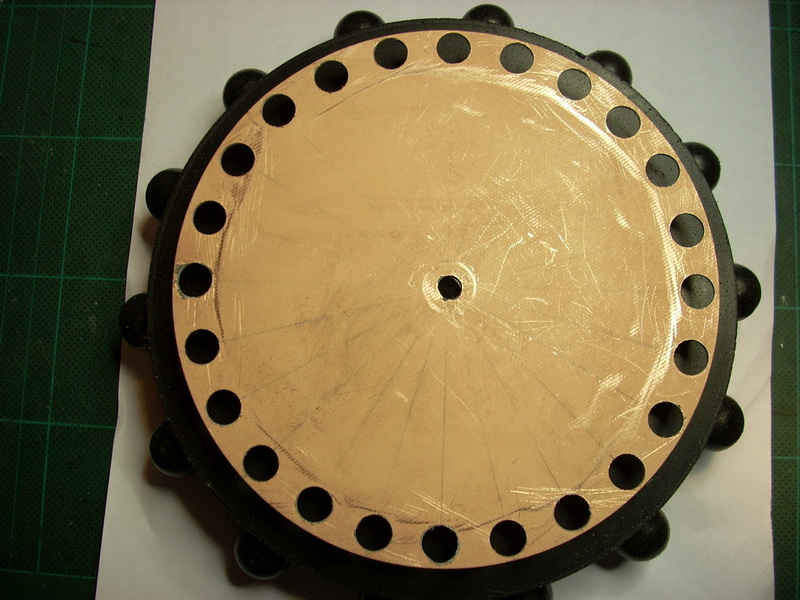 I made the 6" diameter encoder wheel from double sided printed circuit board. The encoder is the Charles Harrow design from the Lesvedome help file. The drive gear (acorn gear) in this picture is the original smaller drive gear which is just over 6" in diameter and has 14 teeth. 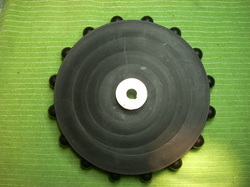 I had to change acorn gears to the larger gear available from Exploradome. This new gear has 16 teeth and is about 7-3/4" in diameter. The larger gear gives me more distance between the motor shaft and gear track for my motor mount and compensates for some out-of-roundness of my dome. The photosensors for the azimuth encoder. 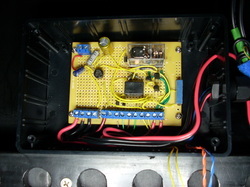 The sensors and associated resistor and diode are mounted on a Radio Shack project PCB. 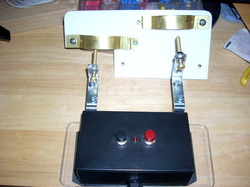 The Home switch and magnet. 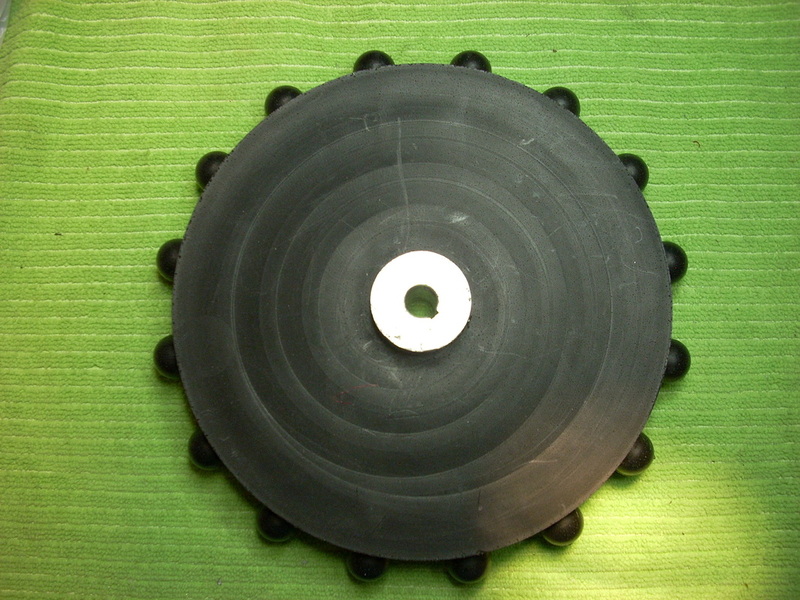 The magnet is attached with double-sided tape to the dome wheel channel using automotive grade tape. Once I'm sure about where I want my home position I will screw it permanently to the gear track. The reed switch is a PC cabinet intrusion switch. The nice thing about using the PC intrusion switch is that it's already attached to a metal bracket for mounting. 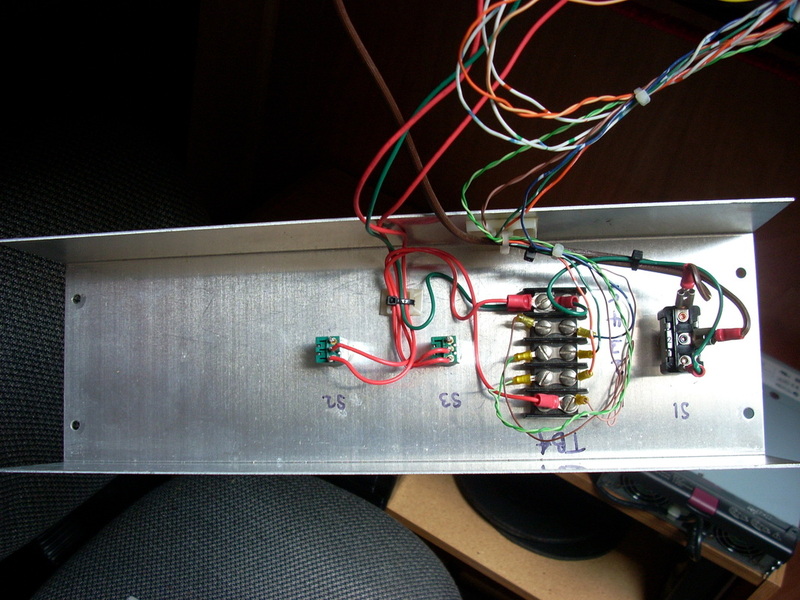 ​This reed switch handles a very small current when switching and has worked flawlessly as a home switch, unlike some of the other reed switches I have been using to switch relays, which is detailed below. 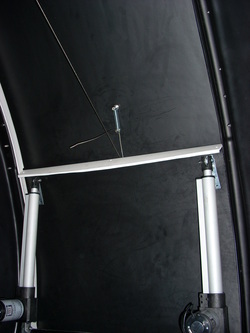 The azimuth track was purchased from Exploradome. As I installed the track I sandwiched rubber sheeting between the dome and track to cover the opening between the dome and dome base ring. I cut slits in the rubber to allow it to curve without buckling and it makes a very good wind and dust shield. It doesn't interfere with the azimuth drive at all. The rubber was a leftover from a Koi pond liner. The E-dome azimuth drive motor and soon-to-be motor mounting bracket. 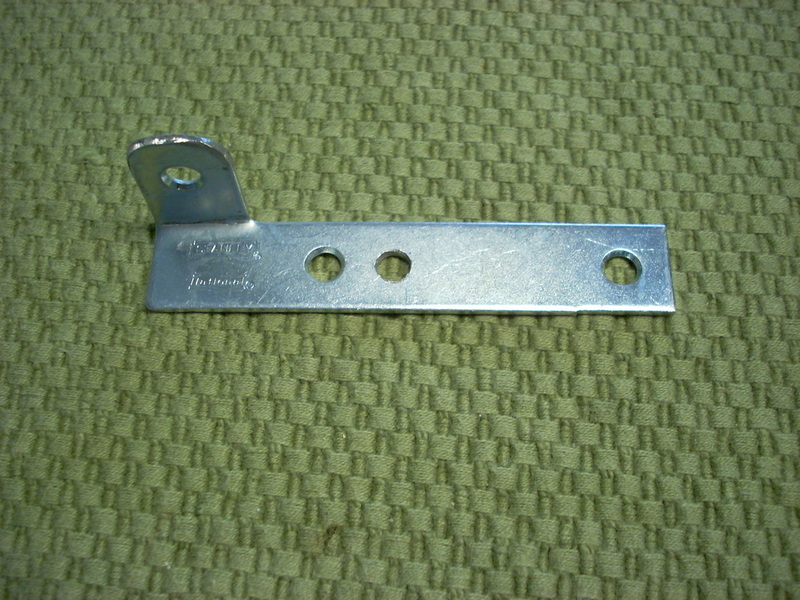 The bracket is a Stanley heavy-duty roller bracket from Tractor Supply and will bolt to the face of the hinged motor mount below. 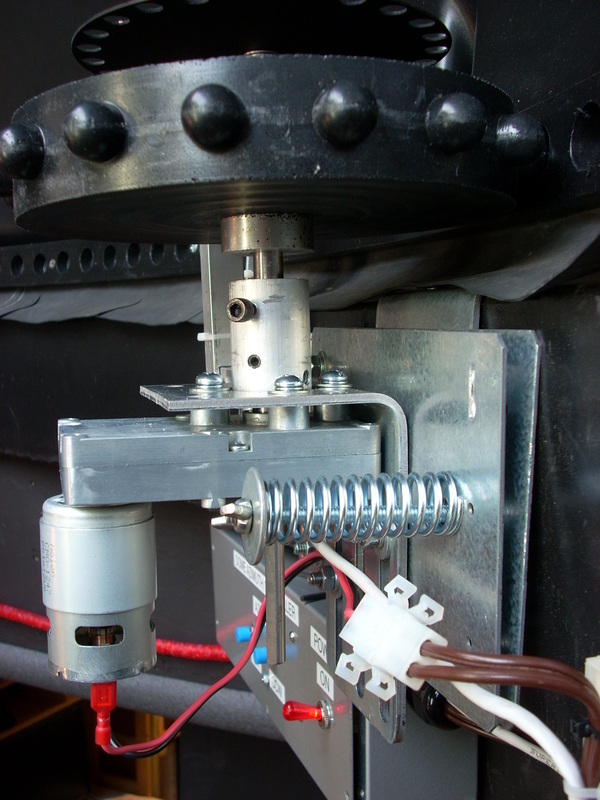 For comparison, the motor for the Exploradome automation package rotates at 11 RPM with ~200 in-lbs of torque. The slower rotation of my motor is not an issue at all. Top view of the motor mounted on the bracket. I cut the 1-1/2" hole with a bi-metal hole saw in a drill press. I then marked and drilled holes for the four 1/4" mounting screws. 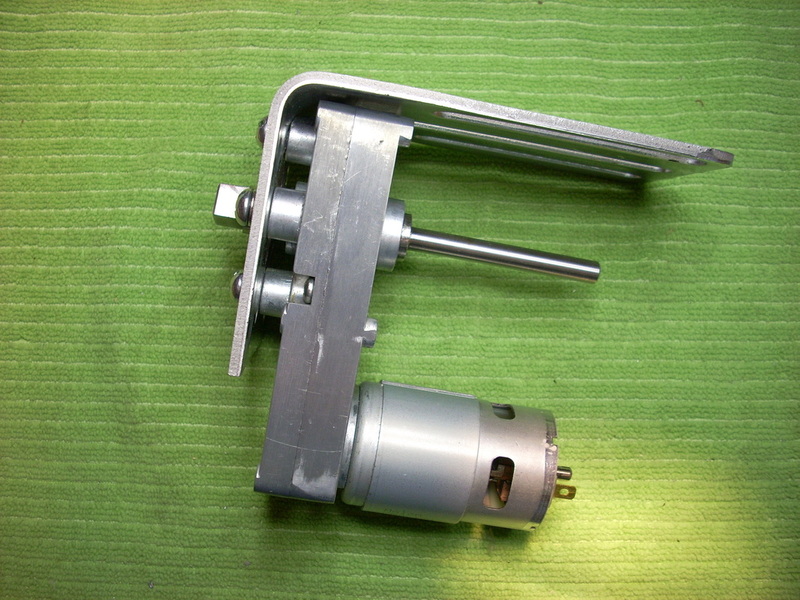 Side view of the motor mounted to the bracket and ready to be bolted to the hinged motor mount. 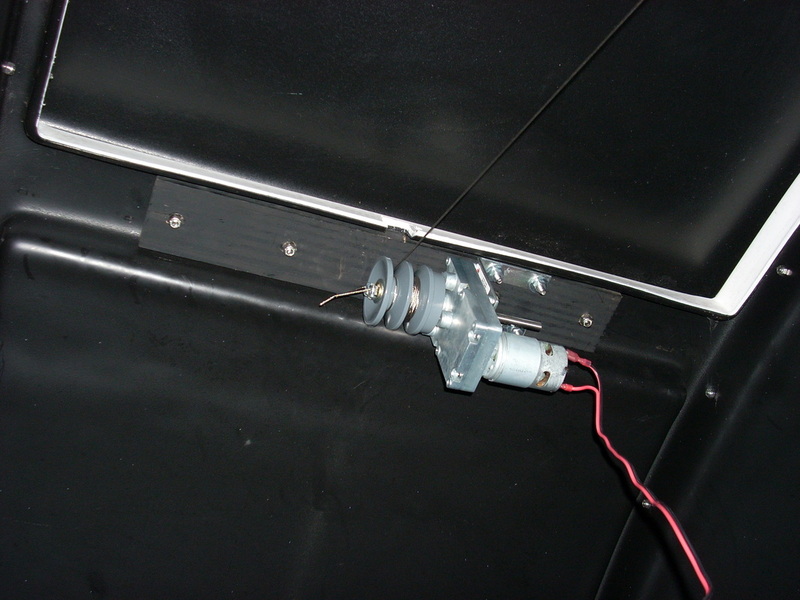 Homemade hinged motor mount. I don't have a welder so I had to come up with something I could bolt together. The galvanized plates and right angle bracket are from Home Depot's lumber section. 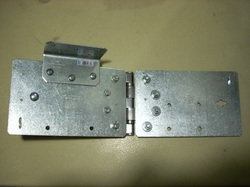 The hinge is a Stanley commercial door hinge with bearings. 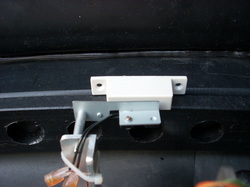 My original hinged mount used a cheap door hinge which rattled a lot. 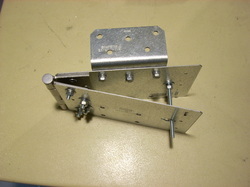 The commercial hinge does not have the play or rattle of the cheap hinge. The hardware is all 1/4"x20. 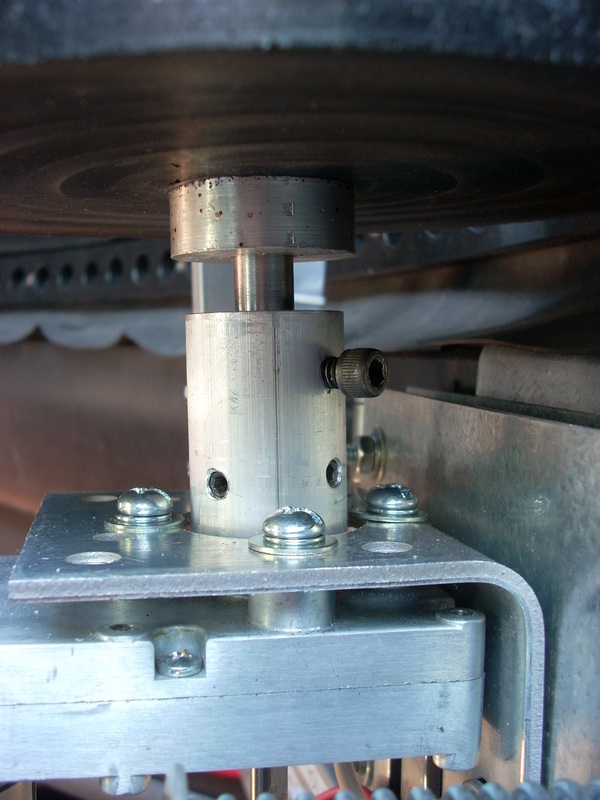 The bolts on the inside plate are cut flush with a hacksaw to allow the hinged plates to close as much as possible. I want to emphasize that to make this hinge mount work I needed the larger drive gear available from Exploradome to compensate for the thickness of the mount itself and for my dome being a bit out-of-round. 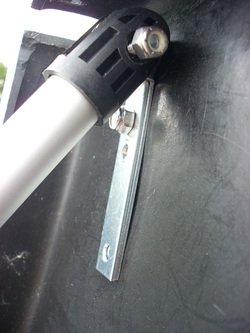 The bolts for the hinge on the back plate are also cut flush with a hacksaw to allow the plate to mount as close as possible to the base ring. To adapt the motor shaft to the drive gear I used a 1-1/4" D x 2" L piece of round aluminum stock to make a shaft adapter (I purchased the aluminum stock on eBay). The motor shaft is 5/8" in diameter and has a squared end. I made the shaft adapter to adapt from 5/8" down to 1/2" (my 5/8" drill bit actually made the adapter bore for the motor shaft a thousandth or so too large). 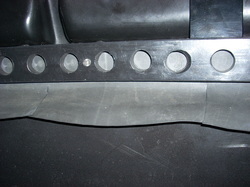 The 1/2" shaft is a piece of round steel stock. The drive gear has a 12mm bore so I turned the end of the 1/2" shaft to 12mm to fit the drive gear instead of boring the gear to 1/2", which would have worked equally well. Because the 5/8" hole in the adapter was a little loose on the shaft I drilled and tapped 4 holes at 90-degrees in the adapter and used four set screws on the squared shaft. This securely locked the adapter onto the motor shaft. 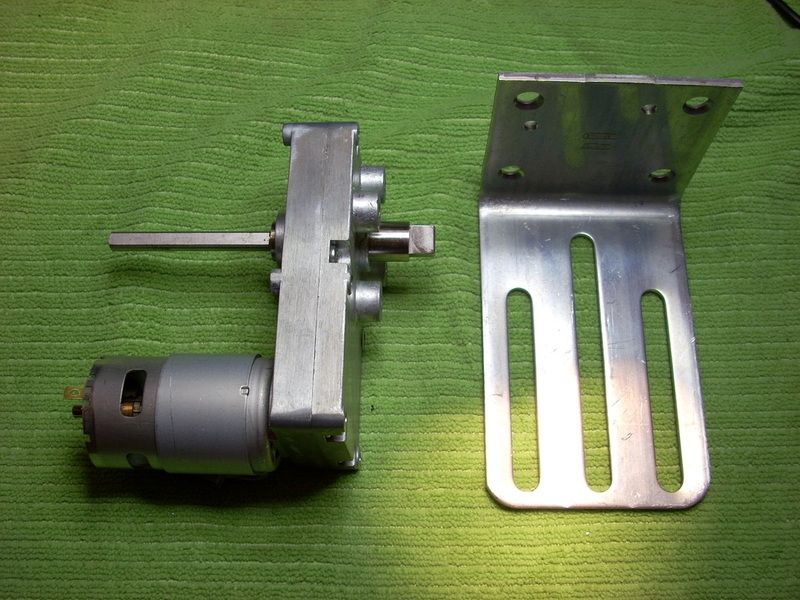 Side view of the motor and mount showing the spring loading of the hinged mount. The spring is a Century Spring Co. p/n C-832. 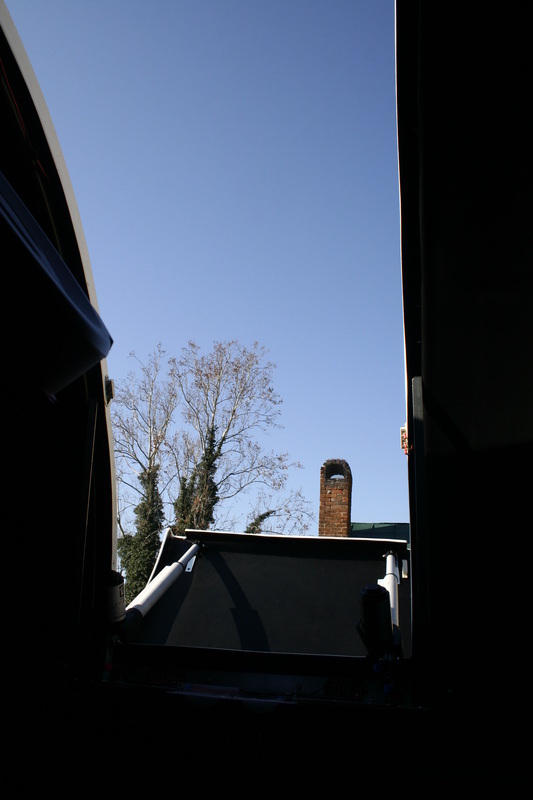 I've read about other owner's complaints of how noisy dome rotation can be on their domes, but after the wheel upgrade my dome is very quiet from outside. Inside the motor and gear box make some noise but I can't really hear much from outside. Also, you can see the rubber dust shield slides right by the drive mount. 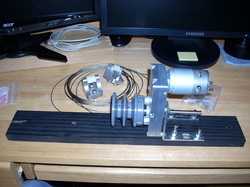 The complete azimuth drive assembly with encoder and home switch. It works well and completes one revolution of the dome in 2 minutes and 16 seconds. Lesvedome setup was relatively simple. I let the software estimate the dome diameter and I made measurements to get the radius, N/S, E/W, U/D and GEM offset corrections for POTH. I tweaked the POTH settings as needed using slews to various targets on both sides of the meridian to ensure the dome does not obstruct my C11. It didn't take long before I had to mod my azimuth drive. The drive works just fine as is but when I added the lower aperture door linear actuators the mounting base for the actuators was in a direct path to decapitate my azimuth encoder. So I moved the encoder to the bottom of the motor and also lowered the home sensor to the bottom edge of the gear track instead of the top edge. 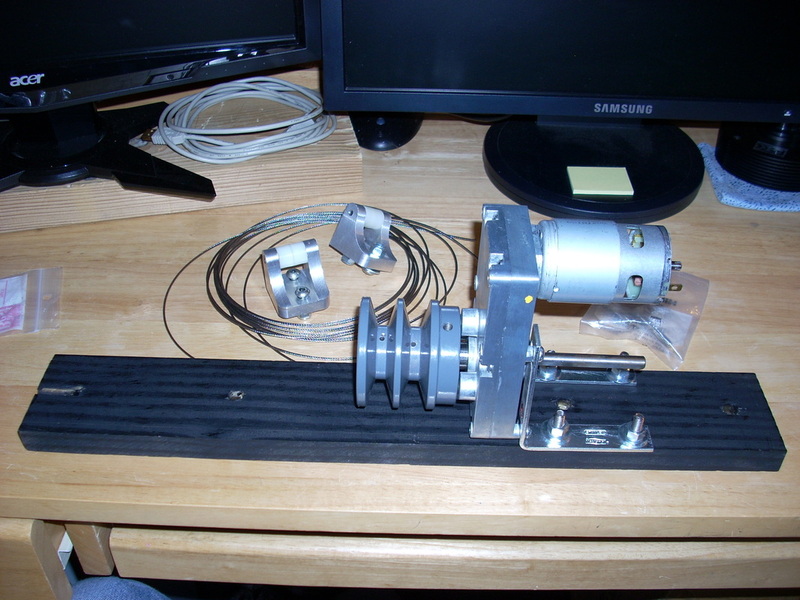 Moving the encoder was easy - I made a shaft extender for the lower motor shaft (the motor has dual shafts) to mount the encoder disk, then flipped the photosensor bracket and photosensors. 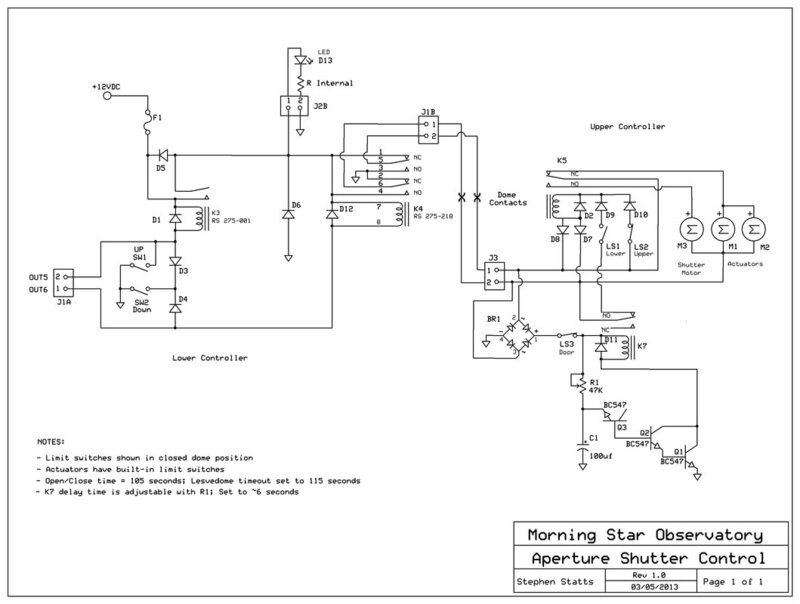 The block diagram of the azimuth control circuit. 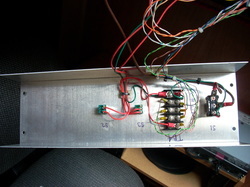 I built the azimuth controller using terminal strips and crimp terminals so I could readily change the design as needed. And I had a pile of terminal strips on the shelf (the terminal strips are also available at Radio Shack). Here's the reason for modding the azimuth drive. I don't have the means to build a metal actuator mounting bracket so I used an aluminum L-bracket and a 2"x6" board instead. It works but doesn't allow anything to extend higher than the gear track as the dome rotates. The actuators came from Surplus Center and are rated for 24VDC, but work fine on 12-volts, just a little slower. I used these actuators because they were cheap at less than $40 apiece, but Surplus Center has several other models that could actually be better choices, albeit at more than double the cost. This actuator only has a 6" extension which is not enough to fully open the door, but it doesn't cause me a problem because I can't view near the horizon anyway. 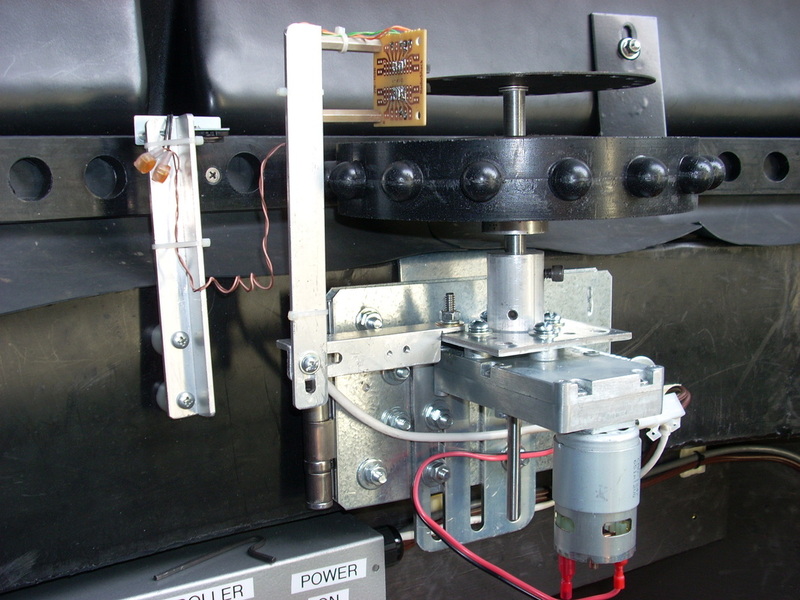 These actuators also have built-in limit switches which stop the motor automatically at the end of travel, so I don't have to take any special consideration for where the actuators are in their travel. All I have to do is send the correct polarity voltage to them. 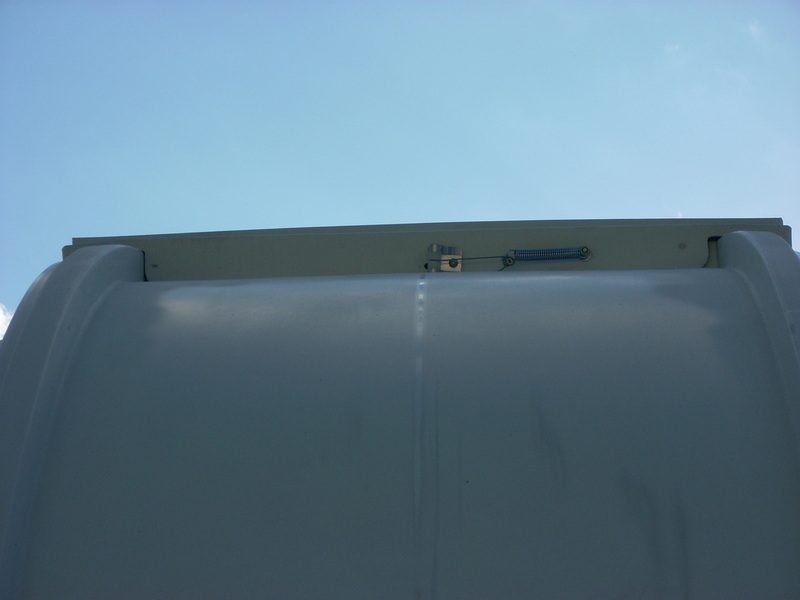 I was having issues with the actuators being able to pull the lower aperture door completely closed. The door would still be slightly open as seen here and the shutter would catch on it as it closed. 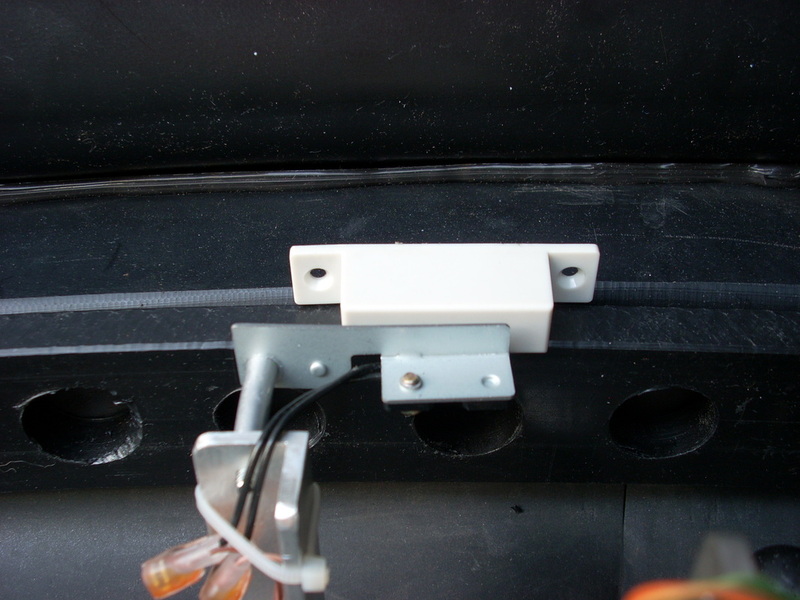 The biggest part of the solution was to trim out some plastic from the inside edge of the door notches to allow the aperture ridge to slide smoothly into the door notch . 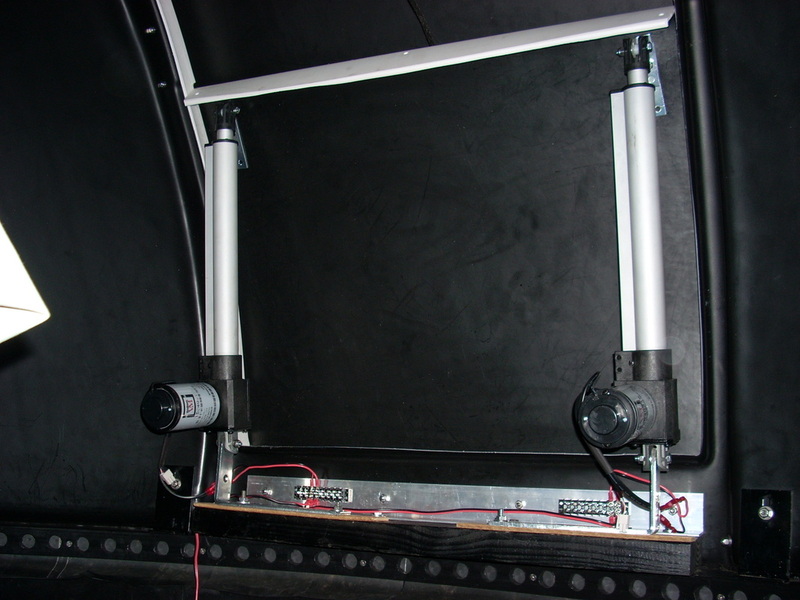 The actuators were also pulling the mounting board up slightly just at the critical point of pulling the door closed that last inch, so the other part of the solution was to add braces from each side of the aperture down to the actuator mount. This prevents the actuators from flexing the plastic dome where the actuator mounting bracket is attached under the opening. 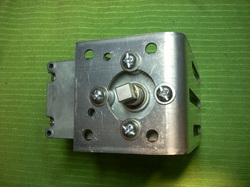 This is an upper actuator mounting bracket. I made it from a Stanley 4" corner brace by bending one leg at a 90-degree angle and cutting it down. 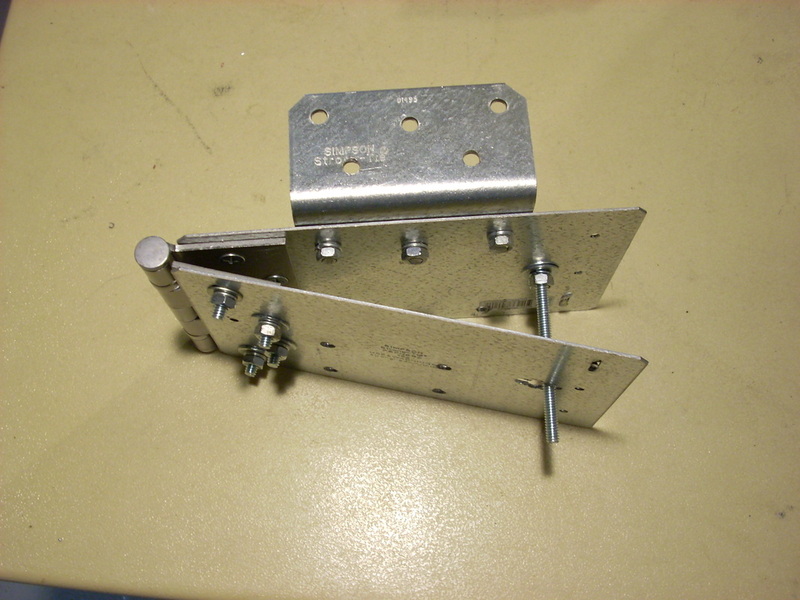 To keep the actuator from bending the brackets I made two for each side sandwiched together for strength. I tried several different size brackets and the actuators managed to bend all of them. 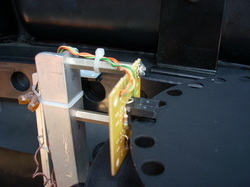 By sandwiching two of the current brackets together, I seem to finally be able to keep the actuator from bending them. I was going to drill a second hole close to the pivot for added strength but I didn't have enough room because of the actuator arm and I really want to keep the number of holes I drill in the dome to a minimum. I think this solution will avoid the need for another hole. 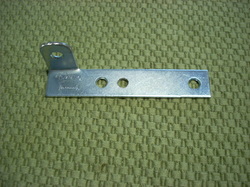 The lower actuator mounting bracket is a Stanley 8" L-bracket with one leg cut down. 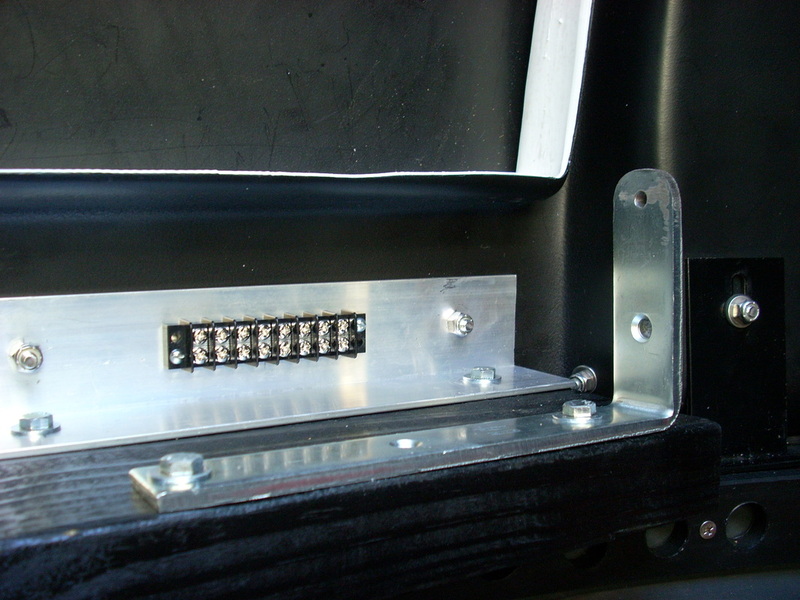 It's bolted to the 2 x 6 board which is lag bolted to the aluminum angle. The aluminum angle is bolted to the dome with four of the Exploradome stainless cap-head bolts with rubber washers. 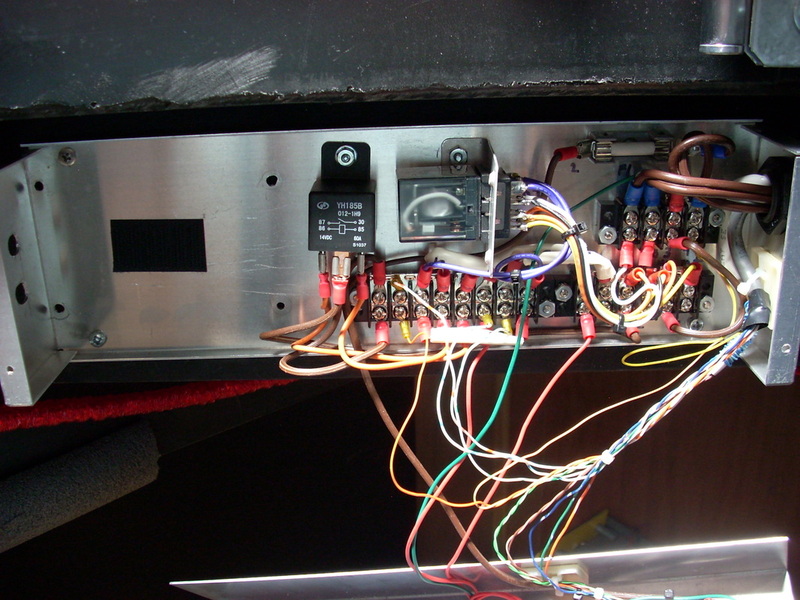 The terminal strip is for the motor and limit switch wiring. 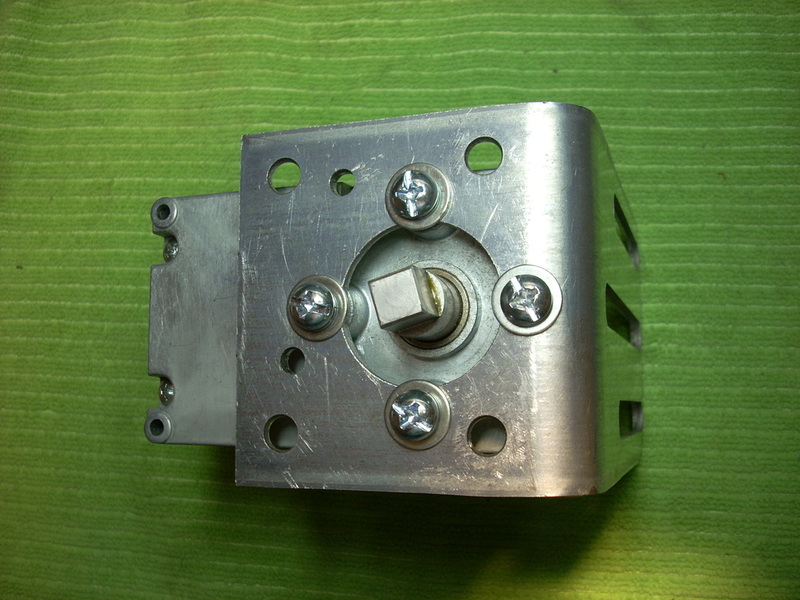 The upper shutter motor & mounting plate ready to be installed. The motor is the same as for the azimuth drive. The double pulley is from Surplus Center and the motor mounting brackets are just two four-inch right angle brackets from the local hardware. Behind the motor mount are two roller brackets for the cable feeds and the stainless steel cable. The roller brackets are actuator mounting brackets that did not fit my actuators, so I re-purposed the brackets by adding nylon rollers. 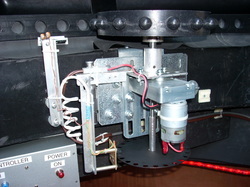 The motor installed with both cables connected. The shutter drive installation is basically the same as in the Exploradome instructions. Since the motor shaft extended less than half way through the pulley, I took the easy way out to anchor the cables by drilling 1/8" holes in both sections of the pulley (see previous photo) and running the cables through the holes and out the bore of the pulley, where I anchored them. The lower end of the cable for opening the shutter is spring mounted to the upper shutter. The cable roller is hidden behind the lower door in this shot, because the upper shutter overlaps the lower door when closed. The cable for closing the shutter is attached to the outside top edge of the upper shutter. 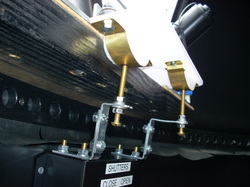 The lower half of the shutter control. The control voltage out of this units feeds the upper half of the controller through contact points in the Park/Home position. The lower shutter control box has manual open and close switches and a red LED indicator that lights when a button is pushed or when Lesvedome is sending control signals. 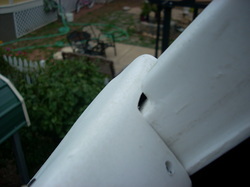 The upper contacts are made from sheet brass and screwed to a plastic base. The lower contacts are brass machine screws with the screw ends rounded off on a grinder. 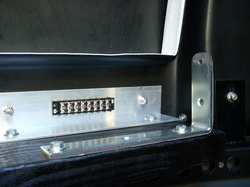 The lower shutter control box and contact points are mounted in the Park/Home position. 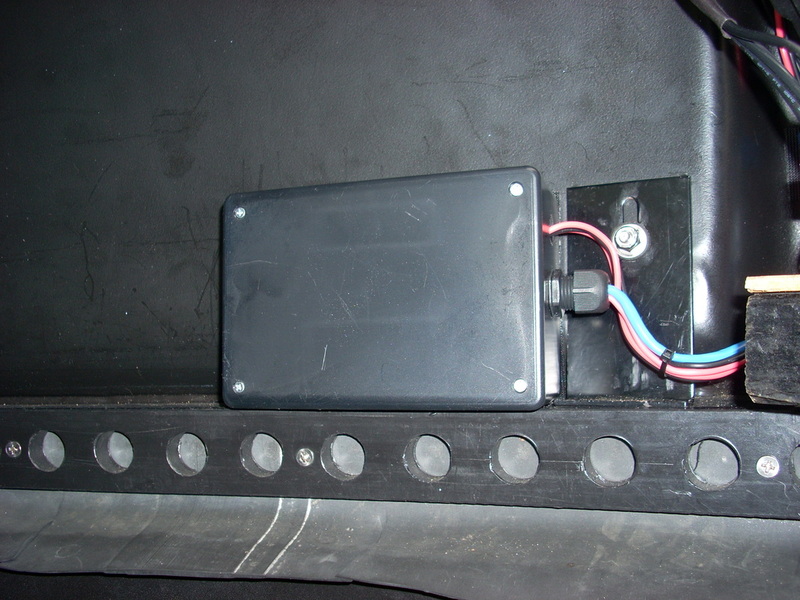 The contacts feed 12VDC with proper polarity for opening or closing to the upper shutter control box. The shutter and aperture door only open or close in the Park position but no batteries are needed in the upper dome. 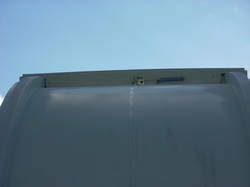 A view of the contact points from below. The dome consistently parks centered on the contacts, so I've had no issues closing the shutters with this method. The upper shutter control box contains a relay to switch 12VDC between the shutter motor and lower door actuators. The polarity of the 12VDC coming to the upper controller determines whether the shutter opens or closes. 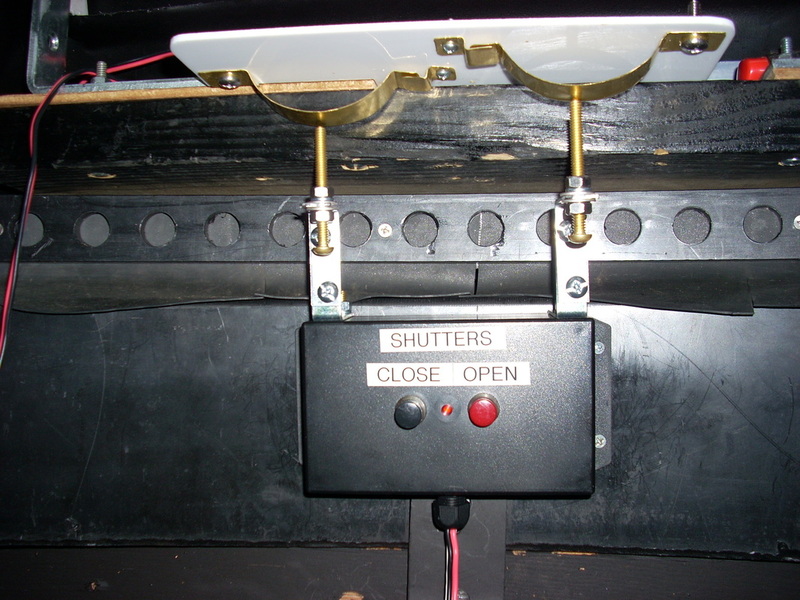 Syncing the lower door and upper shutter when opening and closing is all handled in the shutter control circuit. 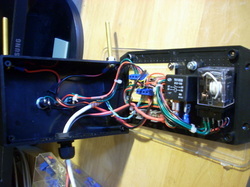 The upper controller box also contains a second relay for the circuit that syncs the door and shutter. 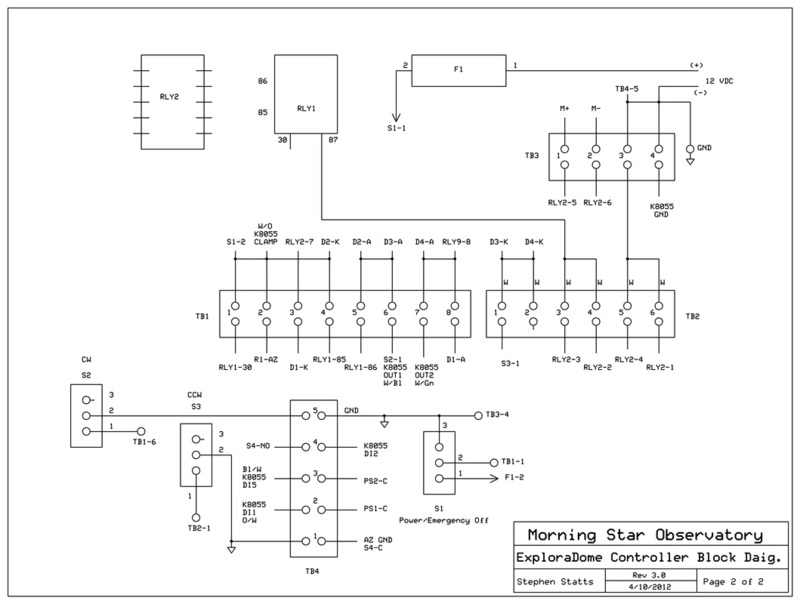 It is part of an adjustable time delay (~6 seconds) between when the lower door magnet switch trips and power is switched over to the upper shutter motor. This is to guarantee power isn't switch from the actuators to the shutter motor before the actuators have completely closed the door, just in case the magnetic door switch toggles too soon. If the lower door didn't fully close then the upper shutter could hang up on it. 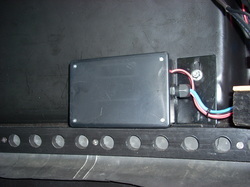 Magnetic switches are used for the shutter's open and closed switches, and for the lower door closed switch. 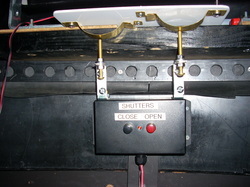 This is the shutter closed switch. All the switches are SPDT and I wired all the switch contacts down to terminal strips where I just picked the contact set, N.O. or N.C that I needed for that particular switch's function. 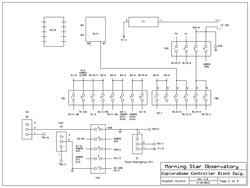 The schematic for the shutter controller. 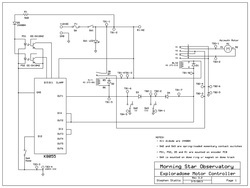 The circuit is divided into the lower and upper controller boxes along the dashed line. 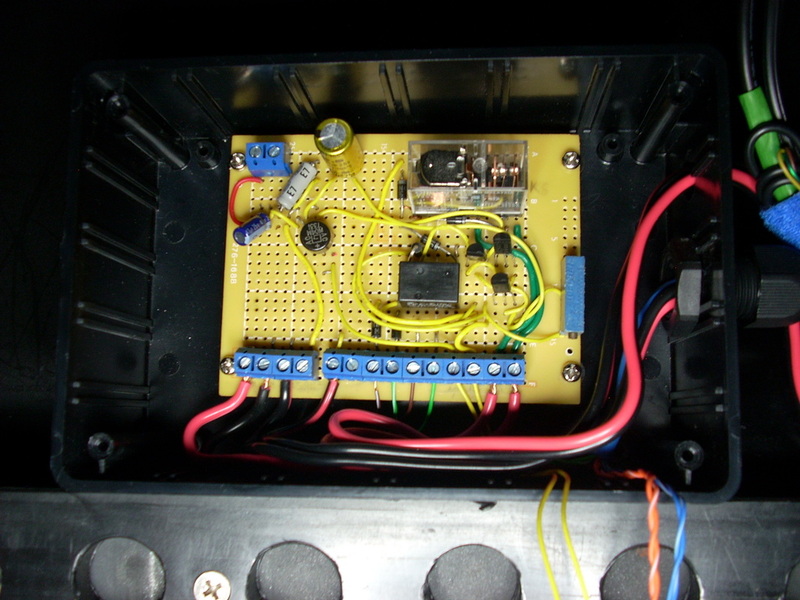 The bridge rectifier provides +12VDC to the timer delay transistors and K7. 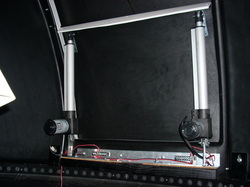 The DC feed between the two boxes is via the lower and upper dome contacts. It takes approximately 105 seconds for the shutter and door to open or close. I set the Lesvedome timeout setting to 115 seconds just to be safe. 2017 update: The electronics at present are basically a breadboard prototype. I have always planned to make proper PCBs but never seem to find the time. Also over time I have noticed an issue with the magnetic switches. Several of them began "sticking" and wouldn't switch unless I tapped on them. I replaced the switches thinking they were defective but the new ones started doing the same thing. I finally surmised that although I'm just switching relays on and off with them, it is still too much current for the reed switches to handle and the contacts are "welding" together. So, I redesigned the circuitry to use the reed switches to switch MOSFETs that actually turn the relays on and off. Then the only current through the reeds will be just the minuscule current in the gate circuit of the MOSFET. 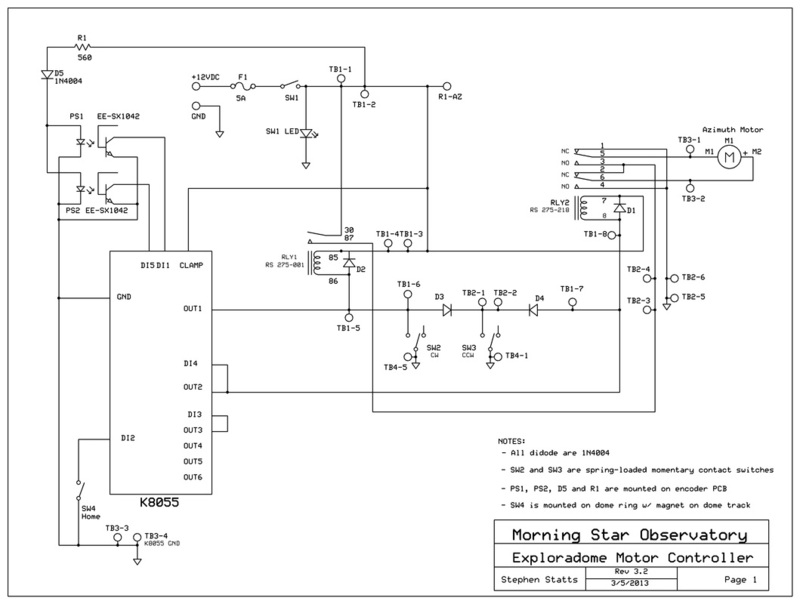 Since I'm moving the observatory in 2017 the new circuit won't get installed until after the move, if at all, as I may not put the Exploradome back up. The Lancaster dome may be the only one at the new site - I haven't decided yet. It would be nice to have both domes but it's a lot of work for just one person and the costs add up after a while. 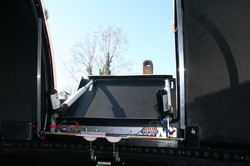 The aperture slot with lower door open. Everything is fully functional now. I really did the shutter and door automation simply because I was annoyed by the manual control ropes and handles banging against my scope as the dome moved. And it's shiny watching everything operate automatically. 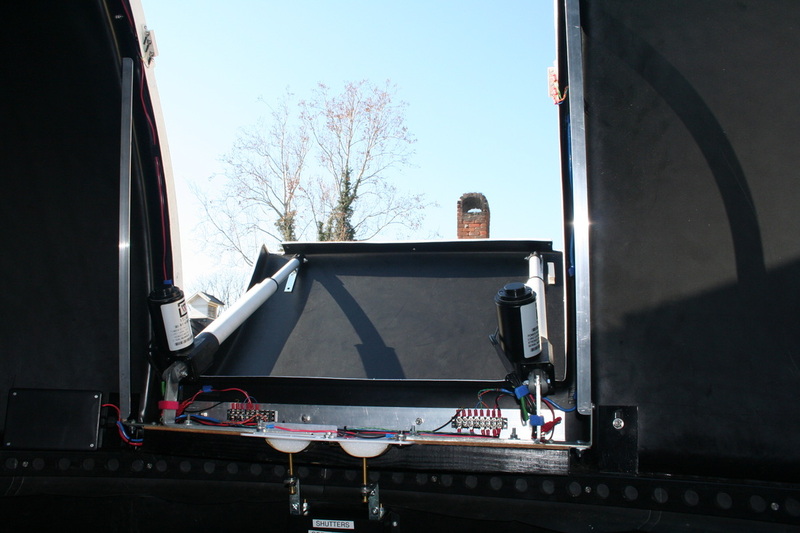 Also notice the door is not fully open using these actuators. To get the door all the way down I'd need a different actuator with more than the 6" extension these have. But with trees, houses and mountains around the obs it's not an issue. To operate the dome I use ASCOM POTH to interface with Lesvedome. POTH requires some setup such as entering AZ and EL, pier offsets, GEM axis offsets, etc. After measuring and entering these settings, I had about a year of near flawless operation. And then suddenly one day the dome pointing went haywire. I use EQMOD to control the mount and EQMOD also connects with POTH. POTH does all the dome calculations and then commands Lesvedome to move the dome to where EQMOD says the telescope is pointing. After several frustrating weeks trying to figure out why the dome pointing was off I discovered that a new EQMOD setting had been added to try to keep the mount pointing at a target on the meridian without doing a pier flip, as would normally have happened before the change. POTH was still calculating the pier flip and moving the dome to the wrong side of the meridian. It drove me nuts until I figured out what it was and changed the setting (side of pier).